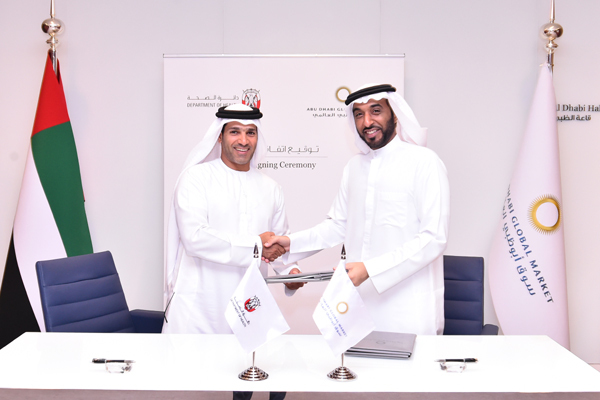 Abu Dhabi Global Market (ADGM) and the Department of Health (DoH) have entered into an agreement of cooperation and delegation to establish a mutual strategic framework and collaboration between governmental entities. The agreement strives to enhance the position of Abu Dhabi as an economic centre in the areas of health, medical and pharmaceutical investments. The delegation component of the agreement designates the DoH to manage the technical initial approvals with regard to all health-related licenses on behalf of ADGM. As per the deal, ADGM will co-ordinate and consult with the Department of Health upon receiving any application for licensing healthcare facilities in their jurisdiction. The agreement bestows delegation to the DoH to assume all powers and responsibility in issuing initial approvals with regard to licenses of health, medical and pharmaceutical establishments as per their regulations. Furthermore, the DoH will have the authority to receive and review applications for healthcare professional licences and health insurance licences operating in the geographical scope of ADGM. Following license registration approval, the DoH still maintains the task of monitoring healthcare facilities and reporting to ADGM, said the statement. The cooperation agreement means greater unification between the two organizations. It will permit greater knowledge transfer and technical experiences relating to the healthcare industry, it added. Through the agreement, an understanding to exchange knowledge pertaining to health, medical and pharmaceutical activities in the financial free zone will be implemented, remarked Dhaher Bin Dhaher AlMheiri, the chief executive of the ADGM Registration Authority, after signing the agreement with Mohamed Hamad Al Hameli, the acting-undersecretary of Department of health. "This agreement propels collaboration and commitment in the field of healthcare. It produces greater economic ties between government agencies and introduces fully regulated healthcare licensing with freezone benefits. The joint efforts of ADGM and DoH will result in furthering Abu Dhabi as a diverse commercial hub," he added. ADGM said the agreement simplifies the process for applicants by registering under the well-established framework of the DoH. It will improve co-operation between ADGM and the DoH in achieving mutual economic and social objectives that will bolster ventures in the healthcare industry. To facilitate and enforce the new collaboration, a joint committee of four members comprising two members from each organization will be established, it stated. The duties of the joint committee will be to review the agreement, provide suggestions or amendments and relay information regarding medical events that pertain to the financial freezone. Al Hameli pointed out that the healthcare was a fundamental necessity and under this auspicious agreement ADGM could harness the expertise of the Department of Health in the field of healthcare.